Direct fit. 58% increase in core size. 165% increase in external fin surface area. Under 2 hour install time. For the first time in over 30 years, the iconic Ford Mustang is available with a turbocharged 4-cylinder engine producing over 300 horsepower! 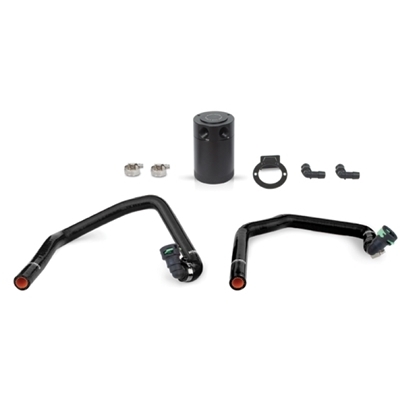 Turbocharged 4-cylinder engines produce extremely hot charge air temperatures very quickly within a few laps on the track or aggressive street driving and stock tube-and-fin intercoolers also heat soak very easily. 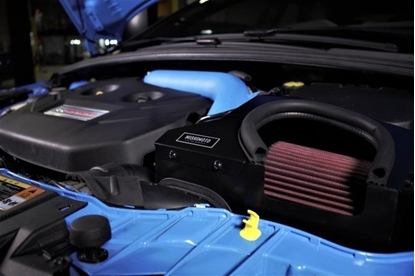 Mishimoto has developed a highly efficient bar-and plate intercooler engineered specifically for the Mustang EcoBoost to keep your air intake temperatures consistently low, run after run. 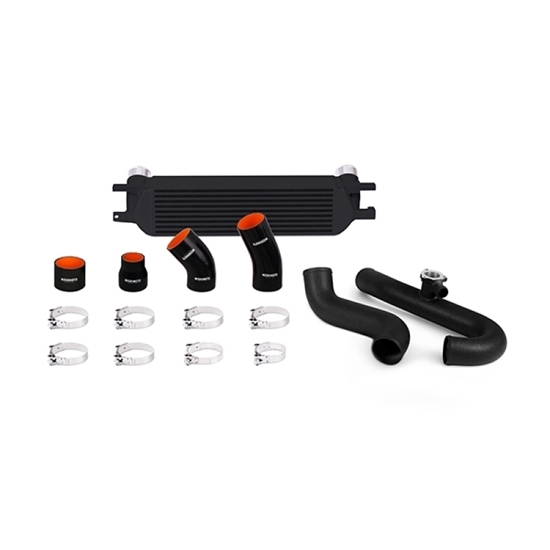 This kit also includes both hot-side and cold-side intercooler pipes, allowing you to upgrade the entire EcoBoost intercooler system at one time! This EcoBoost intercooler is a direct-fit unit and features a 58% increase in core size while requiring no modification to your EcoBoost Mustang. 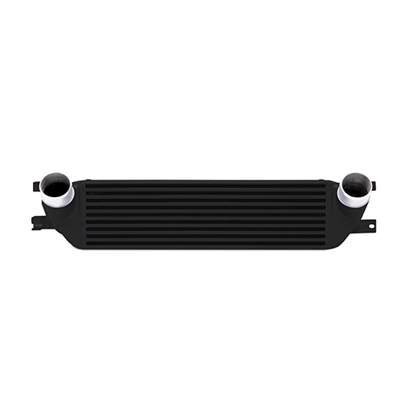 The Engineers at Mishimoto designed this EcoBoost intercooler to fit with the stock active grille shutters, as well as prevent airflow blockage to the radiator and AC condenser by mounting it in the stock location. 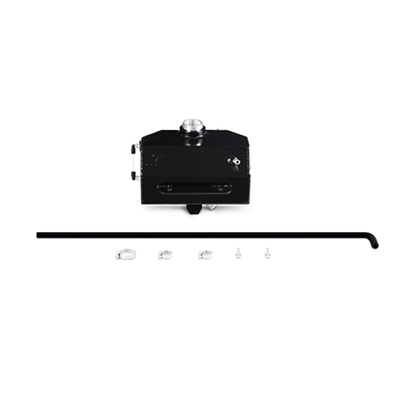 This cooler is constructed with cast end tanks that are CFD tested for maximum airflow and includes an in-tank air diverter, on the hot side, to provide optimal flow through the intercooler. 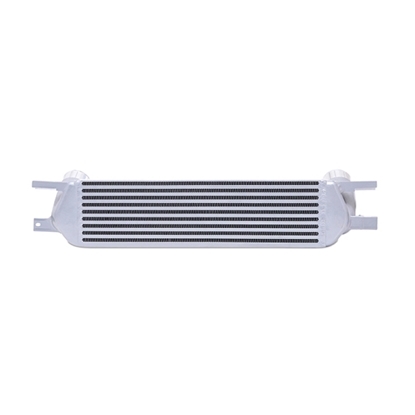 The Mustang EcoBoost Performance Intercooler reduces intake temperatures by 35°F (19.45°C) with minimal pressure loss, has a 25% increase in internal core volume and 165% increase in external fin surface area, providing maximum cooling for your Mustang. This Mustang EcoBoost intercooler features precision TIG-welding and is available with a Sleek Silver or Stealth Black finish. 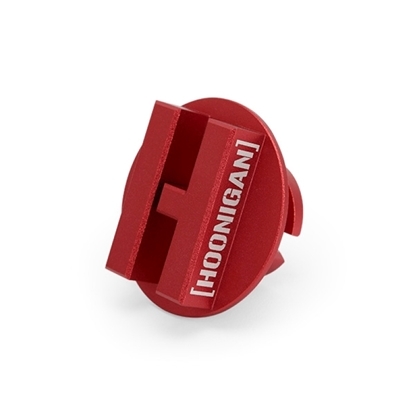 This kit features 2.5"" hot-side and 2.75"" cold-side mandrel-bent aluminum piping for smooth airflow, and four-layer silicone couplers with heat-resistant embedded fibers for improved tolerance against heat and pressure. 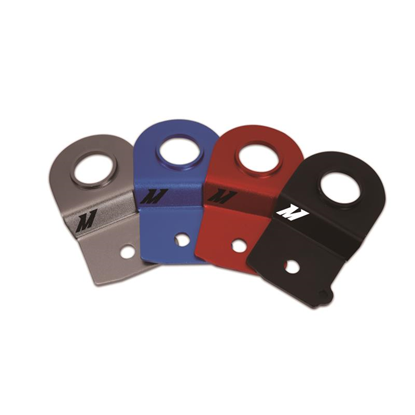 This kit also includes high-quality stainless steel T-bolt clamps for consistent and reliable holding power. The precision CNC-machined BPV flange allows you to retain the stock BPV. 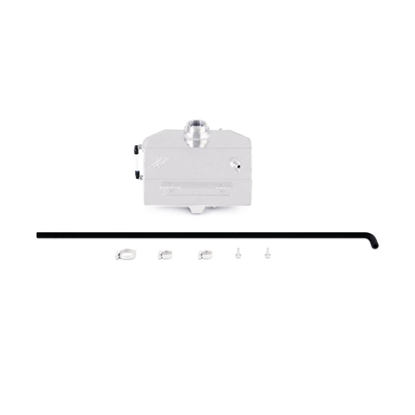 As with all our 2015 EcoBoost Mustang parts, the Mishimoto Mustang EcoBoost Performance Intercooler Kit includes the Mishimoto Lifetime Warranty.